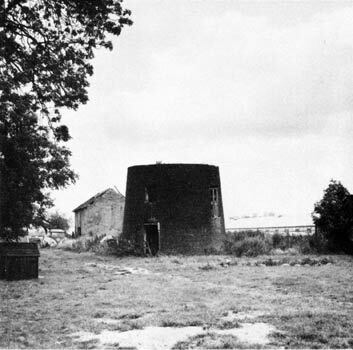 Rockland St Peter tower mill was built in the first quarter of the 1800s and stood at Old Mill Farm beside the mill house on the Scoulton Road, just north of the Wayland Union Workhouse and some 1½ miles north of the village. In 1875 the mill complex included a bakery and a butchery but by 1970 only 2 derelict storeys of the mill tower remained. 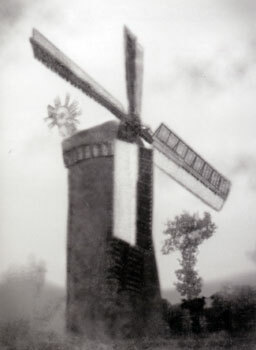 At the time of the above photo the cap petticoat had been painted red, white and blue in celebration of the coronation of King George V.
Frederick Lincoln is seated on top of the mill's cap, Thomas Arthur Lincoln is on the horse and William Lincoln is standing to the right wearing a cap. Frederick Lincoln was later killed in service during World War I and was buried in France. 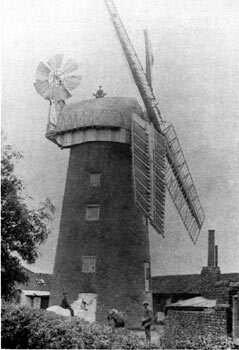 The 5 storey mill had a Norfolk boat shaped cap with a petticoat, gallery and 6 bladed fan. Four double shuttered sails, each with 8 bays of 3 shutters powered 2 pairs of French burr stones, an oat crusher, flour bolter and dresser. The cap petticoat had an ornamental chamfer at the rear on each side. By the early1900s a portable steam engine was being used to power a single set of stones. All that capital New erected WINDMILL with two pair of excellent French stones and a full sized Flour Mill with a double motion and about 5 acres of excellent freehold Land, standing in Rockland St. Peter, three miles from Hingham and four from Watton and now in the occupation of E. Clark who will shew the premises. and various other Effects, the property of Mr. Elijah Eglington. Sale to commence at 11 o'c with the Furniture. Catalogues post free on application to the Auctioneers, Attleborough. A Capital TOWER WINDMILL, good Dwelling House, Barn, Stables, Miller's Cottage, Counting House, roomy Warehouses for Corn and Seeds etc. 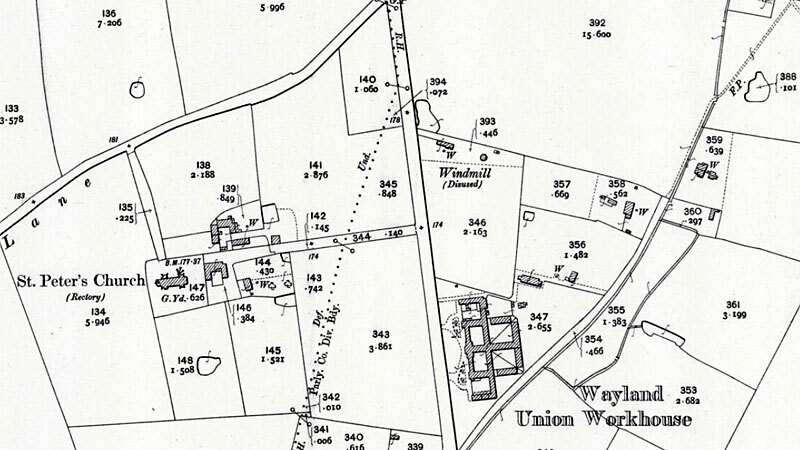 with about 5 acres of Land situate at Rockland St. Peter 5 miles from Attleborough and 5 from Watton where a profitable business has been carried on for several years. Apply to Mr. Timothy Colman, East_Harling_Mills. WANTED, a Youth as an APPRENTICE to the Milling Business. Apply to James Tennant, Rockland St. Peter, near Attleborough. Wanted, a steady industrious Married Man to Work a Tower Mill. Apply Mr. G. Filby, Rockland, Attleborough. A house provided. 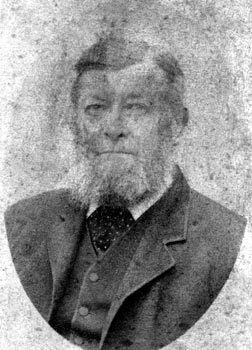 John Lincoln (1825-c.1904) who bought the mill in 1875, was well educated for the time and read a lot. 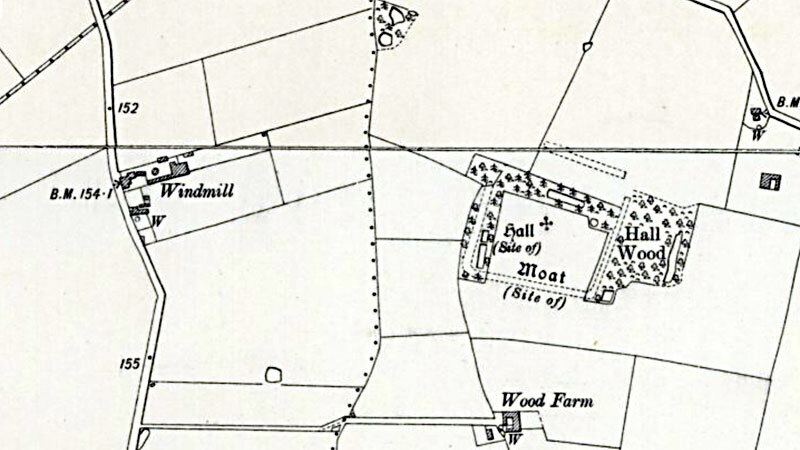 He was a Methodist preacher and held services in his barn where he would also hold a childrens' picnic at Whitsun and other times of the year, providing lemonade and cakes for the children who apparently came in wagon loads. He was a strict father but a good and honest businessman, often giving extra weight. John Lincoln's son William Henry Lincoln (1863-1931) was apparently tricked out of the business by an unscrupulous lawyer during the first world war. ... fined £3 including costs. Red, white and blue petticoat. Portable steam engine drove one pair of stones. My name is Claire Louise Dove Attfield and I was born at Old Mill Farm on January 15th 1969. 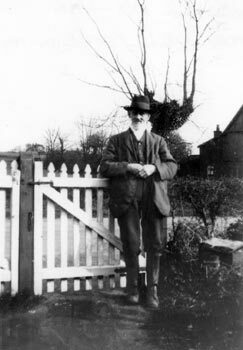 My father David Attfield was the person who saved the last two storeys of the mill from falling down. I was also christened at the barn in 1970 by Pastor Ray Brown of Rocklands St Peter. We sold the farm in 1972 to moved to South Africa where I still reside. My father died 9 years ago but my mother (85) who lives with me still remembers the Lincoln's who lived in a cottage nearby. A story is told of my dad working on the roof of the mill, finishing it's restoration, when he heard my voice very near. At 2 yrs old I had climbed up the extension ladder to the roof to have a chat with my dad. He, cleverly, asked me to climb down and fetch mum, which I did. He always said it was the closest he came to a heart attack. Mr Buick bought the property from us and still lives there I believe. I unfortunately suffered a house fire 10 yrs ago and lost all my photos which included photos of the mill and house being renovated. Hope this adds a bit more insight into the property.